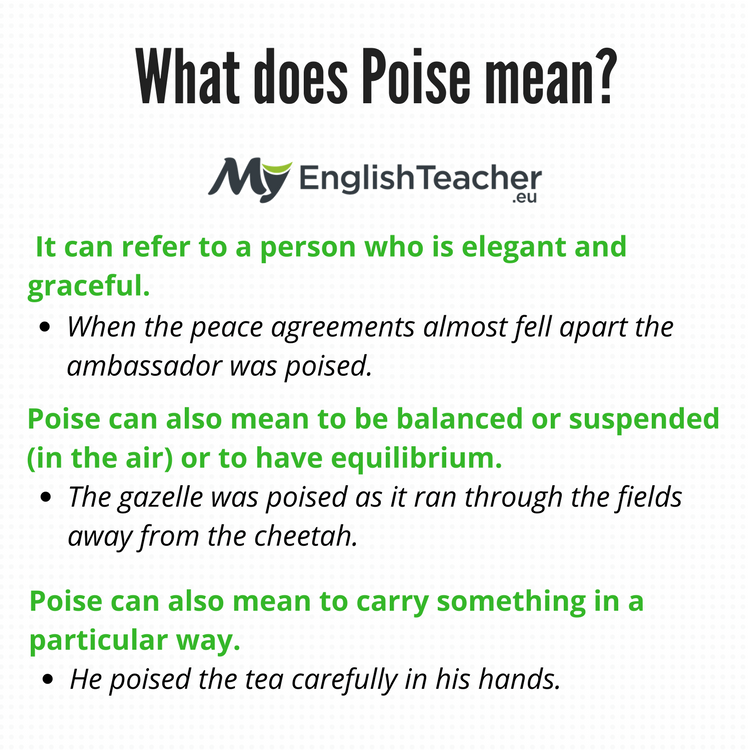 Home English Vocabulary What does Poise mean? Poise has four meanings. It can refer to a person who is elegant and graceful. This can be used to speak about someone’s physical appearance, for example the way they carry themselves. Or it can refer to how some deals with a difficult or complicated situation. When someone is poised it means that they carry themselves well and in an elegant way. When someone handles a situation with poise it means they are steady and stay calm under pressure. When the peace agreements almost fell apart the ambassador was poised. The model is poised as she walks down the runway. The most important thing in this negotiation is for you to remain posed no matter what happens. 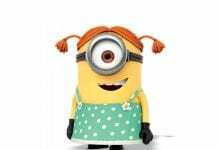 She walked into the room with poise, and refused to let yesterday’s embarrassment get to her. There are many synonyms for this usage of the word poise. Here are some of the most popular. Grace- refers to simple elegance or refinement. This is especially used when referring to how a person or animal walks or carries themselves. Grace is usually used to describe movement. 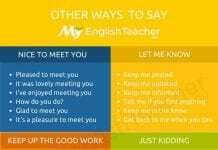 It can also be used to describe how someone behaves in a difficult situation. The dancer gracefully moved across the stage. When doing yoga it is best to move with grace. Elegance- refers to something being graceful. It can describe a person or an object. It can also mean that something is stylish. The designer’s clothes were clean and elegant. Her mother reminded her, that a proper lady remains elegant at all times, no matter what is happening around her. Agitation- refers to someone being in a state of anxiety or nervous excitement. When someone is agitated they are usually not fully in control of their emotions, and tend to have many small, quick involuntary movements. He was clearly in a state of agitation after speaking with his father. I don’t want to make you agitated, I just want to talk calmly. Crude- refers to something or someone that is not refined. When a person is crude they are lacking manners, they may get emotional easily or panic in a difficult situation. Her crude jokes did not go over well with the group. Even though his table manners were crude, it was clear he had been taught manners. Poise can also mean to be balanced or suspended (in the air) or to have equilibrium. This definition of poise can refer to a person or an animal. Think of a ballet dancer balancing on her toes, that’s poised. The gazelle was poised as it ran through the fields away from the cheetah. The acrobat poised on the tight rope during his show. The proper way to run is poised on the balls of your feet. He poised on the balls of his feet as he snuck quietly through the house. Here are some synonyms for this definition of poise. Balance- is an even distribution of weight, allowing something to stay upright and steady. Balance can refer to someone or something being able to physically stay on their feet, or it can refer to someone’s state of mind. The box was very heavy, and he had to work very hard to keep his balance. He has a steady, balanced personality. Control- has many meaning, but as a synonym to poise it refers to the ability to influence or determine the course of one’s behavior. He doesn’t seem to have any control over his actions. When you are lifting weights, make sure you do your repetitions with control. Instability- refers to something or someone being unstable, unpredictable, or not able to stay steady and upright. This can refer to someone’s physical state, or it can refer to their mental state. The building’s instability made it very dangerous. The instability of the company made the employees nervous about losing their jobs. Poise can also mean to carry something in a particular way. He poised the tea carefully in his hands. He poised the present with care, knowing a puppy was inside. Poise can also mean that someone is assured that something is going to happen. I am poised to get the new promotion. She was poised to win the race until she sprained her ankle. Previous articleWhat does Indicted mean?